Floater Album Release Party with The Breaking-SOLD OUT! 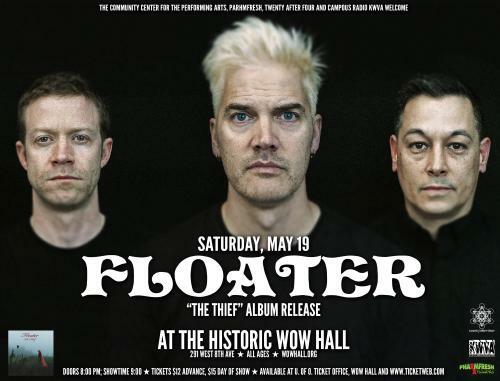 On Saturday, May 19, the Community Center for the Performing Arts, PharmFresh Flowers and Twenty After Four proudly welcome Floater back to the WOW Hall for a Record Release Show. The band is celebrating the release of their ninth all-original album (and 13th overall), The Thief, on Typhon Records. Opening the show is The Breaking. Known for intense and unforgettable live performances, Floater is a homegrown Oregon hard rock band whose fans are legendary for their dedication. Floater will play Portland, Eugene, Medford, Chico, Seattle, Spokane and Bend in support of the new record. The last Floater shows at the WOW Hall were in September of 2014, when the band played two nights in celebration of their 20th anniversary. The first night they performed the entire album Acoustics from start to finish, and the second night they did Glyph (and a lot more). “We got our start in Eugene, and we really got our start at the WOW Hall,” Rob Wynia told the Register-Guard. Floater was founded in 1993 by Robert Wynia (bass, vocals), Peter Cornett (drums) and David Amador (guitar). The band celebrated the release of their first album, Sink, at the WOW Hall in 1994. A CD Release Party for Floater’s third album Angels In the Flesh, Devils in the Bone, was held here in May, 1998. The release party for Burning Sosobra came to the WOW in October 2000. Floater experimented with acoustic in-store performances throughout the late 1990s, and eventually began including entire acoustic sets in their performances. An all-acoustic album of original songs, Acoustics, was released in 2004. Four years later, Floater released their third live album, Floater Live Acoustic at the WOW Hall. After selling out the WOW Hall a record number of times and developing a regional following, Floater relocated to Portland. Their long string of “Favorite Local Band” awards here was followed by "Best Band" in the Willamette Week's "Best of Portland" reader's polls for 2009 and 2010. Floater celebrated the release of original album number eight, Wake, at the WOW Hall in 2011. In the years following the Wake tour, the band members slowed down a bit and concentrated on their personal lives, spending more time with their families and playing fewer shows. They took most of 2015 and 2016 off. Singer-songwriter Rob Wynia finished writing and recording his second solo album, Brave The Strange, which was released in 2017. He toured in support of the release as Robert Wynia & The Sound – featuring Dave on guitar and Mark Powers on drums. In July of 2017, Floater was officially inducted into the Oregon Music Hall of Fame. They played a short set with Pete on drums that was to be his last with the band. Mark Powers made his debut as Floater’s new drummer on December 31, 2017, at the Star Theater in Portland. The Thief is the first album to feature Powers on drums. At once original and strikingly familiar, their debut LP is reminiscent of early Radiohead, R.E.M., Oasis and U2's Achtung Baby. With two exploratory EPs under their belts, the band has landed on their definitive sound and channeled it into a debut full-length record, released in 2017. The Breaking has been bringing their energy-infused live shows to venues around the west coast from their native Portland, Oregon. The band rounds out their work with frequent collaborators on recordings and live shows, with producer Rian Lewis (D.R.A.M., Priory) and drummers Mark Powers (M. Ward, Robert Wynia, Haley Johnsen), Cheo Larcombe (March Forth), Alexandra Geffel (Skull Diver, The Cabin Project), and Ben Kent (Ghosts I've Met).